Testing of the complex software systems stands to be very critical, not only to release superior quality products to the market but also to keep the existing products fault-free and stable. When starting with test automation, frequent checks and efficiency should be your primary goals. However, many of the test automation efforts still are very far from being efficient. And this is not a good sign for any type of business. Test automation is indeed a boon to the IT sector. It offers a lot of scope to both the software testers and the developers. If performed right, test automation can take your software projects to an entirely new level, yielding you high profit. But if you fail to realize the full potential of test automation and do not implement it right, it will rather remain worthless for your purpose. 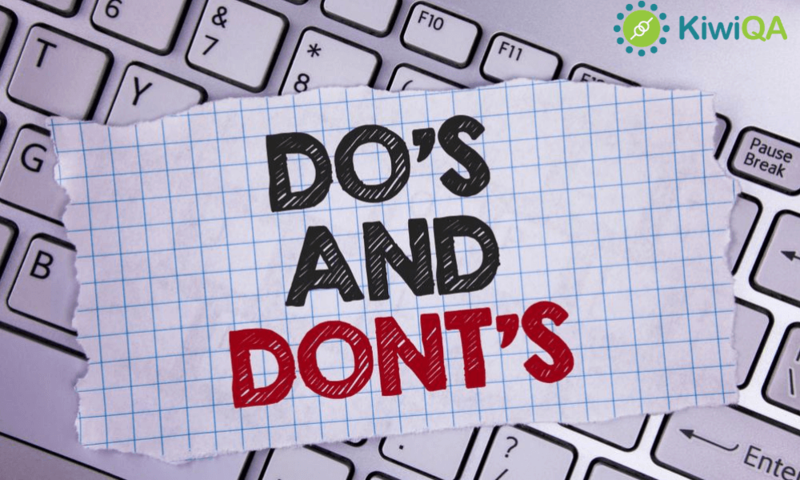 Here are some basic dos and don’ts that you should keep in mind while planning test automation. Considering these tips will imbibe in you more confidence to start your test processes with a better approach. So without wasting any more time, let’s go ahead and start our discussion. Detecting issues will be easier for you if you have a suite that contains shorter and more specific scenarios. Do not test everything in a single test scenario. In that way, troubleshooting will become very difficult. So, try keeping it shorter and simpler. Every test is different. Certain tests are hard to develop due to technology constraints. Other tests do not require running frequently. Hence, choose which tests you require automating. Always consider the return on investment you will obtain by automating the tests. As you start, only consider creating what you require and go with the project’s workflow. Frequent changes constantly occur in the projects. Do not waste energy, money, and time on creating the things that would never be of any use or would get changed in future. Consider creating the suite gradually as you go. The functions, which are quite simple to test often, are covered by a huge quantity of tests. This results in increased test numbers within some areas, while the others that are possibly more crucial are left badly tested. This, in turn, leads to reduced risk coverage. Hence, you need to set your priorities consciously. Establishing skills and knowledge within one’s own business is very important for achieving long-term success. Hence, you should always carry out your software testing with professionals. Every project needs some time for its design and requirements to get stabilized. You will need to consider carefully the efforts that you put in developing the tests as your requirements can also frequently change. This is the balance you should work with. You have to be careful in deciding when developing automated tests is cost-effective. Have a clear understanding of the objective of the test that is running. If you do not require testing a certain area, then just don’t. Only test the functionalities that need to be tested. Testing all other things would do no good and will be a waste of time. Although you can no doubt have continuously running checks, just ensure their objective is clear. Manual testing holds a very important position in the world of software testing even today. Manual tests can help you detect issues that you never really expected could exist. Do not replace the manual tests with automated tests. Test automation is just an addition to manual testing. Automating a particular test scenario should have a specific reason and purpose. It should add some value to the software project. Begin with those mundane tasks, which you anyway do every day. That is actually where you will identify the first reward of your test automation efforts. You must create and prepare the test cases constantly for the newer requirements. This will enable you to make sure that there is higher risk coverage always and your functions work smoothly. You already know the importance of developing a robust test strategy. The tips mentioned above are not guidelines, but they are suggestions that can strengthen your approach to performing test automation. If you are carrying out automation make sure you do it perfectly because an unplanned and inefficient game will just be a waste of time and resources. Looking for a reliable automation testing service provider? Contact us now!